Dreaming of An Intimate Romantic Elopement? 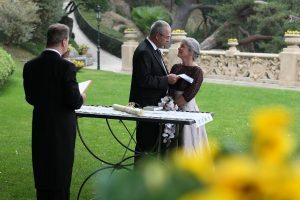 There is no doubt about it, a personal choice to be married privately in a romantic location outside your own country is becoming increasingly popular. There are many fantastic reasons to follow the sun and enjoy a romantic adventure for two. If you only have yourselves to consider there is considerably less planning. Some couples simply wish to avoid the stress associated with inviting those who ‘should’ be invited. Of course there is always the risk of disappointing those who would have loved to attend your destination wedding abroad.. but at the end of the day how you conduct your wedding is your choice to make alone. 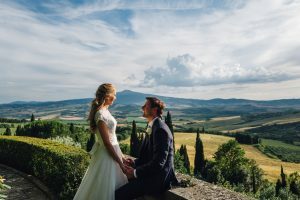 Italy is a fantastically diverse country, both linguistically and culturally, offering many exciting possibilities for an intimate ceremony according to every scenic and sensory taste. You can choose a stunning location situated along Italy’s seductive coastline, boasting sun drenched beaches or instead sail out to one of the many dreamy islands.. or you could opt for an ancient landscape characterised by acres of vineyard and olive groves, punctuated by medieval castles and Villas of historic interest. Luxurious Hotels or rustic Farmhouses too all set the scene for a memorable outdoor Blessing experience. Tuscany is a natural favourite in terms of incredible light and colour. 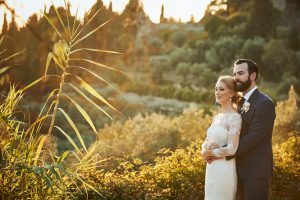 There is something incredibly enchanting about the combination of Tuscan sunlight, sandstone and olive trees. Florence, Siena, Cortona, Lucca and the majestic countryside which surrounds each popular medieval city are popular choices because there is so much to experience. 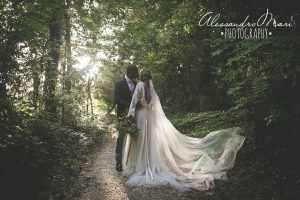 Photographic images and video are lasting proof of your inner happiness and wonderful gifts to share with those hoping to see your dress, location, expressions and emotions whilst saying I do! Being well used to being in the spotlight, Tuscany is enviably spontaneous and relaxed in front of the camera. If you align yourselves with its vibe and go with the flow natural during your ceremony, your photos and/or video will be outstandingly beautiful. For those who wish to remain based in a city for logistical purposes Florence is probably the easiest and most rich in terms of choice. There are many wonderfully imposing medieval Castles and towers overlooking the celebrated city that gave birth to the Renaissance. Escaping to the relative peace of the surrounding hills is only a taxi ride away. Wedding photographers with detailed local knowledge know exactly where to whisk you off to capture those intense love filled gazes at sunset. Venice offers a perfect sense of mysterious elegance and is undeniably the jewel of Italy’s north. As such it is easily the obvious choice for a luxurious destination wedding ceremony. Spellbindingly Gothic, Byzantine and Moorish architectural influences conspire to create Venetian class and its labyrinth of hidden streets offer intrigue, adventure and refinement. 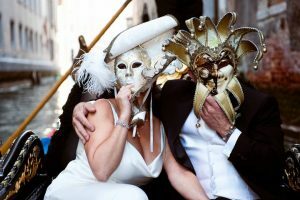 Easy to navigate by boat or Gondola and with a wide selection of sumptuous photo opportunities, Venice is stylishly eclectic and continues to captivate international couples seeking the ultimate in Romance. The Italian Lakes are in a class of their own and justly popular. From the wistfully filmic appeal of Lake Como to the breathtaking beauty of Lake Garda and Lake Maggiore, Italy’s lakes never fail to disappoint and are home to many majestic Villas. Sardinia and Sicily are paradise on earth with crystal clear sea views, champagne coloured beaches and the most wonderful cuisine imaginable. There are unusual locations and cultural traditions to add a splash of mediterranean colour to the memory of your special day. The choice of wedding location is not an easy decision to make and the options are many but Italy is like your first love.. wherever you find it you will never forget it.. and it will remain in your heart forever.